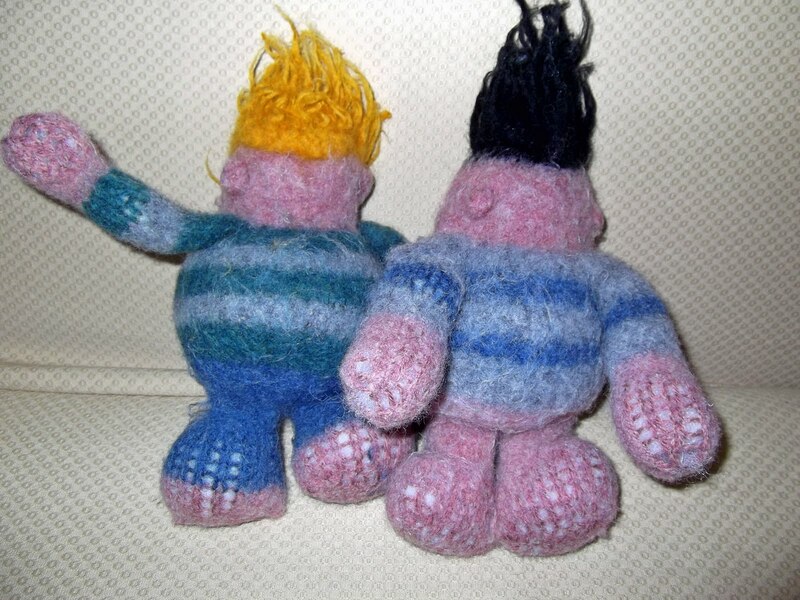 My latest project has been doll knitting. I found the pattern for "Felted Kuku dolls" in Love of Knitting magazine. The knitting is really easy - all stockinette stitch with a couple rows of purl two together and knit front and back in the same stitch. The only unusual stitch is the "bobble" that makes the ears - and that's basically knitting and purling in the same stitch multiple times. There are two rectangles for the legs, a bigger rectangle for the body and head, and two smaller rectangles for the arms. The rectangles were sewn together and stuffed with fiberfil, and then hair was added. I followed the directions with the black haired doll, pulled a strand of yarn through and then knotting it, but I did the yellow haired doll like rug hooking, only with really long loops. Then, following the directions, I pulled some non-wool yarn through to hold the fiberfil in place. 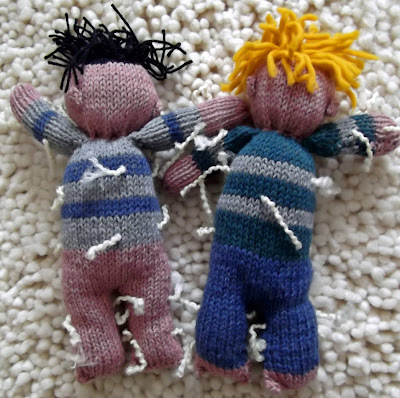 I won't do that with my next doll, or I'll do it very differently, because all of those white strands of yarn ended up as a mass of tangled soapy yuk in the washing machine after felting. 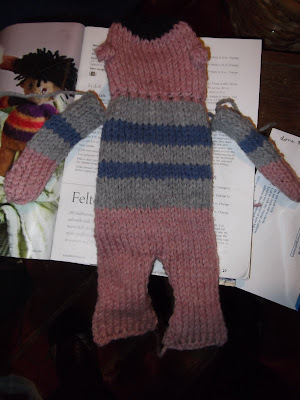 I learned that I had overstuffed both dolls - you can see how over-stretched the hand and feet yarns are. 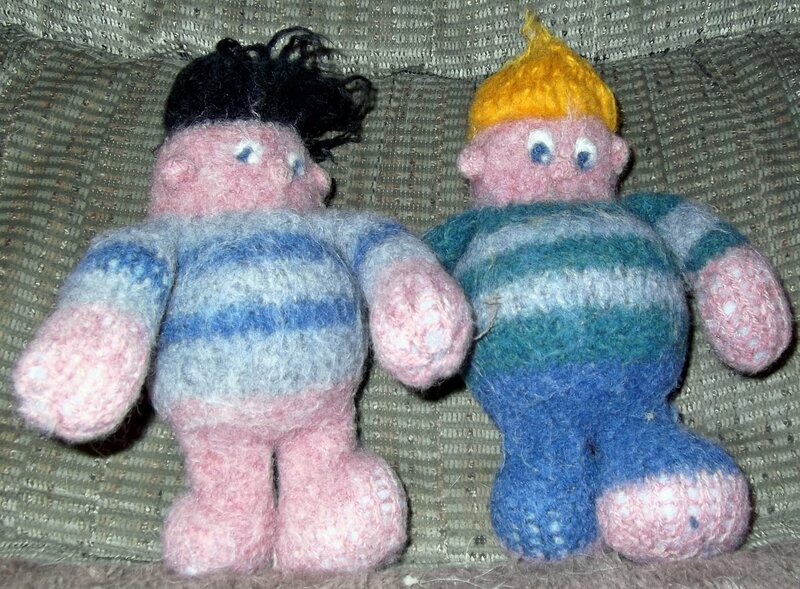 I pulled some of the stuffing out, but the yarns would not relax (because they're felted!) With the hair sticking up, the dolls are about eleven inches tall. I needle-felted some eyes and saw the dolls finally have some personality - so then I added some needle-felted little snub noses. I took the dolls to the senior center today to show a couple people and then sat them in a chair next to me when I played Bingo - and I won, so I think they make lucky charms. I learned several things with these two dolls that will help while I knit some more. I'm planning to donate them for our senior center rummage sale which will probably be in October. I'm going to be really careful about where I store these dolls, Gibby can't seem to take his eyes off of them. I'm sure he thinks I'm making dog toys. These dolls are fun! What a great idea. You will make one for Gibby, won't you?